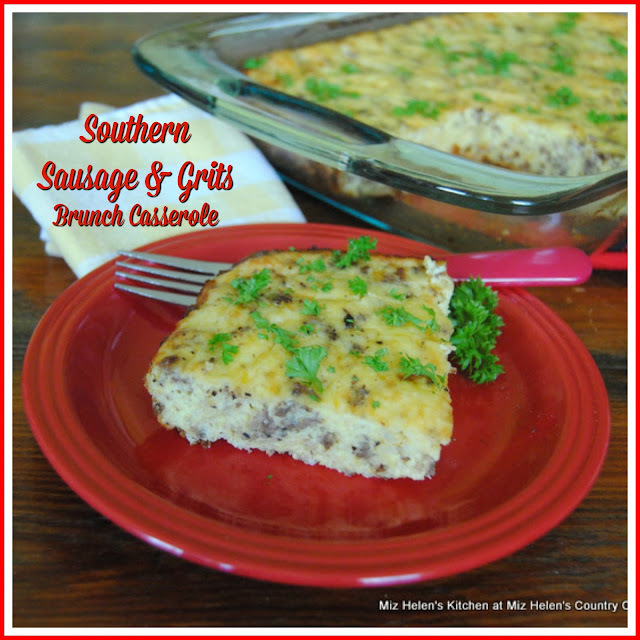 I am expecting a group of friends and family to stop by for brunch over the weekend and wanted an old favorite brunch casserole to serve. This is a casserole that my Aunt made for her ladies club spring brunch and passed the recipe on to other family members and eventually to me. 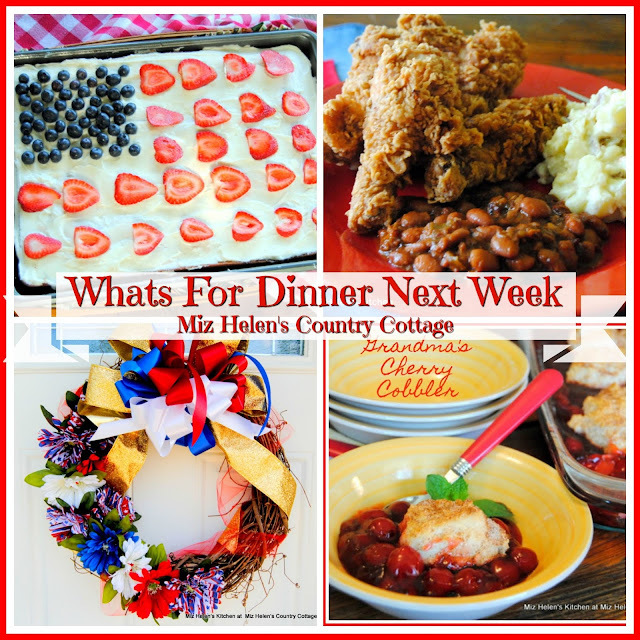 I have changed it a little, but it still has the great flavor for this southern combination. 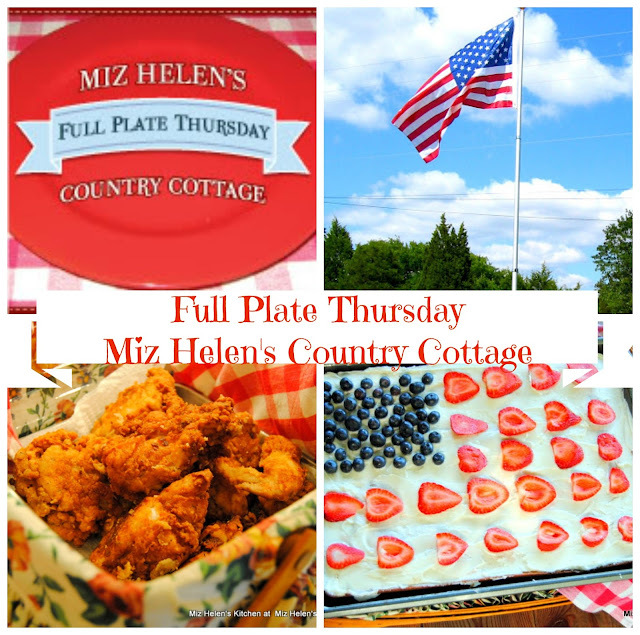 This is a very easy casserole to make and is ready in no time to set on the table for folks to enjoy! I love a salad that can be the star of lunch or dinner and that is exactly what this recipe is. 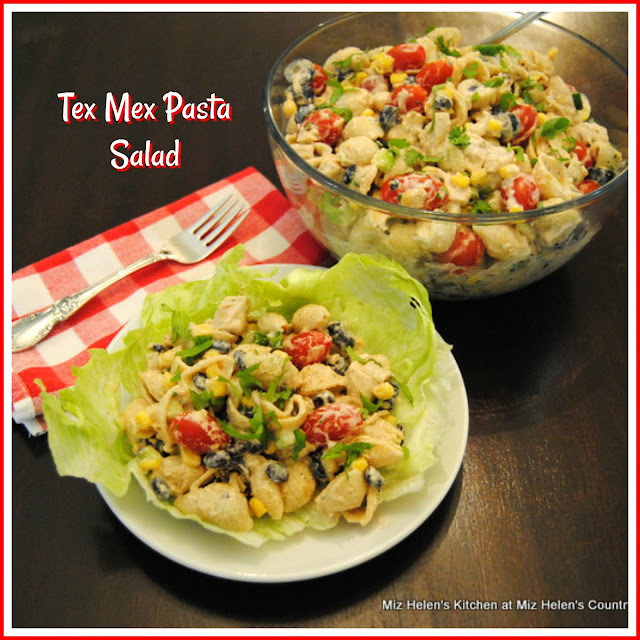 It has a wonderful base of pasta and chicken filled with Tex Mex flavors. This is a great salad to take to a Pot Luck lunch or dinner and it is a winner at the family dinner every time! I used chicken that I keep on hand in the freezer, I grill or poach the chicken, cut it up, package it in 3 cup bags, then freeze it. I can always put together a great chicken dish from the little freezer bags. Hi everyone, so glad you could come to the party today, it is always good to see you. 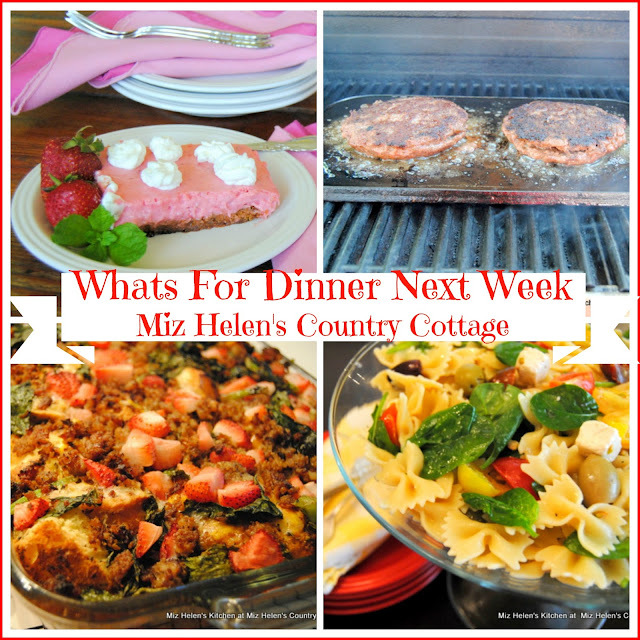 The cottage is busy this week as we get everything ready for the Memorial Day Weekend, which is always a big opening weekend for the lake here. Hope that each of you will have a great weekend full of safe activities. Be sure and stop by to visit some of the great blogs that are featured today. Now lets get this party started! 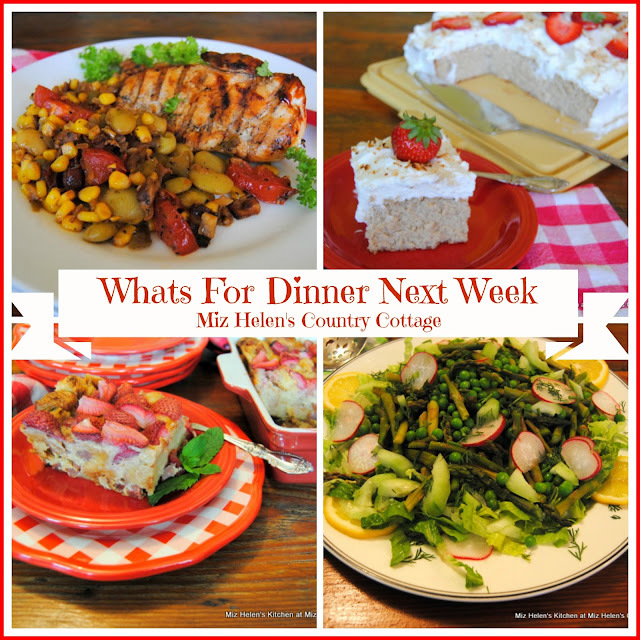 When we have fresh green beans and potatoes in the garden I can't resist making this flavorful Slow Cooker meal for my family. If my vegetables are not ready to hit the Slow Cooker, then I can always pick up the ingredients at my local farmers market. When you walk in the front door in the evening the aroma of this dish announces a great dinner ahead. This is a full meal and all you will have to add is a nice salad and dessert for a delicious meal. 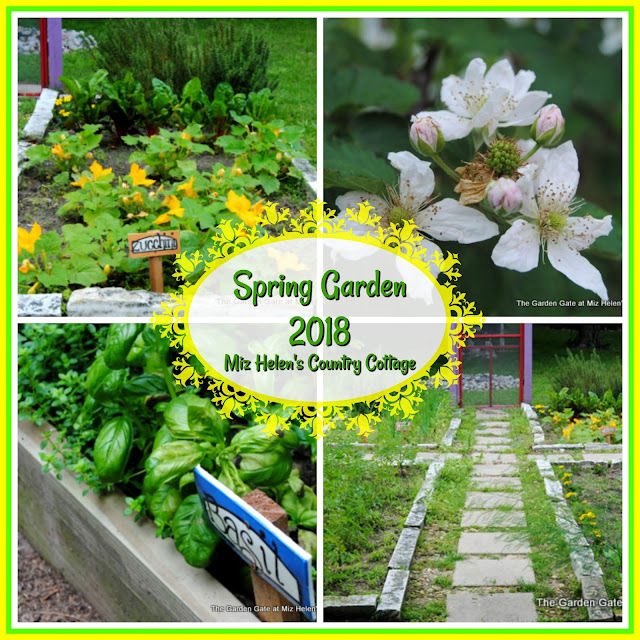 What beautiful spring weather we are having, just perfect for taking a walk to the garden and bringing back wonderful fresh vegetables for our meal plans. It seems that everyone has a since of renewal in the spring as the weather is warmer and we can enjoy being outdoors. 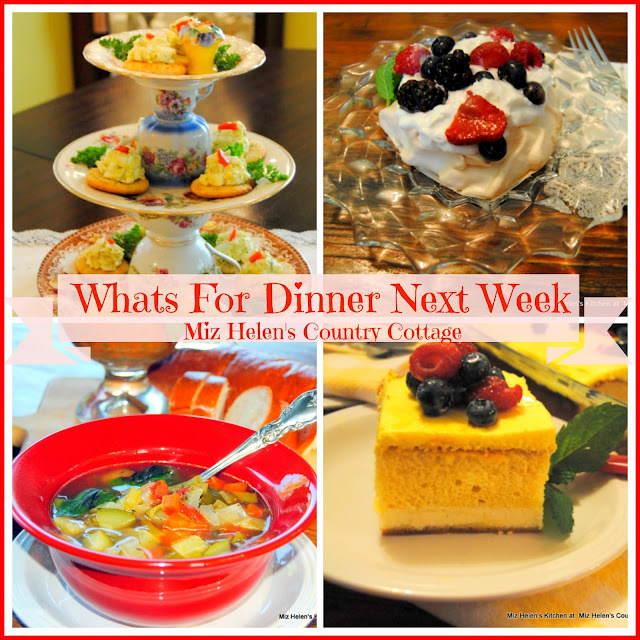 I will be including some of my garden finds on the meal plan this week plus I am hosting a very special Ladies Luncheon. Hi everyone, I am so glad to see you today, what a great day to take a drive to the country. Come on back to the Up Stairs Garden area we are having our party by the beautiful bird area where we can enjoy our wonderful recipes and watch the beautiful birds. 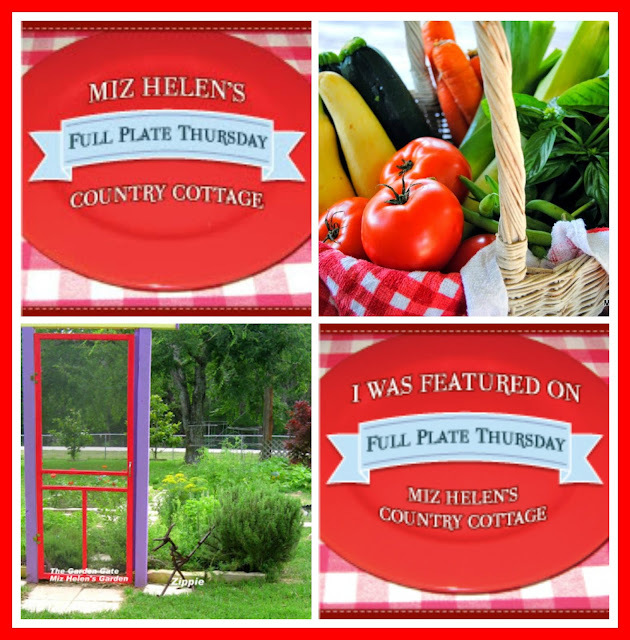 Be sure and stop by the awesome blogs that we have featured today and we look forward to seeing what you are sharing with us today! 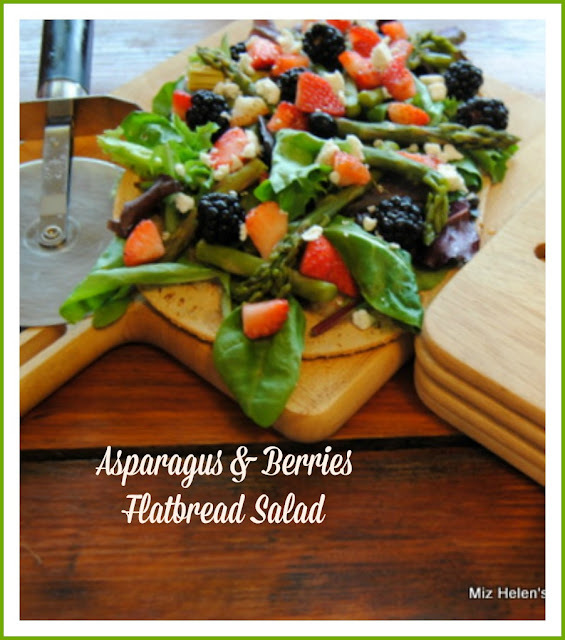 This Flatbread Salad is one of my favorite salad's to have for lunch. I love the combination of vegetables, salad greens and fruit, then topped with a little cheese. All of this goodness is heaped on a cheese covered flatbread, then drizzled with a wonderful vinaigrette. Relax at your favorite table and enjoy! I get so excited when the green tomatoes start showing up on the vines. 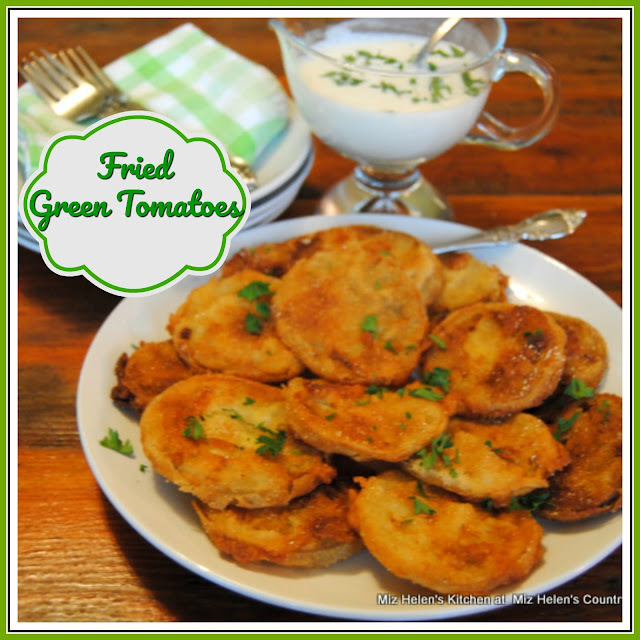 Most of our very first green tomatoes every year will be turned into Fried Green Tomatoes, it is a treat that we look forward to and just love. My recipe is a family recipe that was handed to me by my Grandmother and it has been changed very little since that time. Lets get these green tomatoes in the frying pan. It is great to see you today,and we are so excited about our party today. We have some awesome features to check out from last weeks party so be sure and stop by to say hello to these great bloggers. This is the time of the year that we have added our Canning and Preserving Features and we will have them through Canning Season. We are having some beautiful spring days here in the country so we have our tables set up by the garden today. We have beautiful squash blooms to decorate our tables thinking about the upcoming Mothers Day this coming weekend. I can't wait to see what you are bringing to share with us for our Spring Mothers Day Table. My Chicken Cacciatore is one of those recipes that can be made for a special dinner with friends or a week night family meal. I have been making this recipe for years and my recipe card is about worn out. The dish is full of flavor and very easy to prepare. Just put it together and come back later in the day to a fantastic meal. 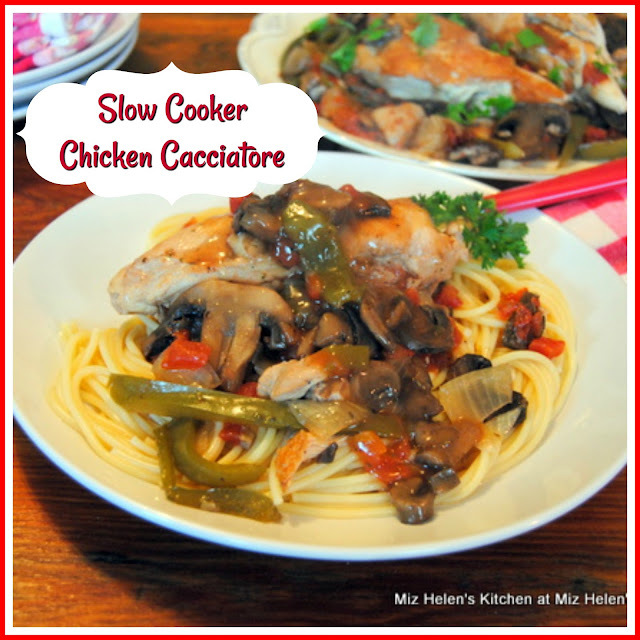 Slow Cooker Chicken Cacciatore has wonderful Italian flavors with a special blend of vegetables. Our friends and family love this dish and hope you will to. I am excited about this week of Cinco de Mayo and coming up this weekend I am off to my annual spiritual retreat. I always look forward to my retreat weekend for a time of rest and renewal, plus this year we are celebrating our 25th year together for a annual retreat. I can't wait to see what you are sharing with us today so lets get the party started! When the vegetables are plentiful in the garden and at the Farmers Markets it is time to make some wonderful fresh salads. 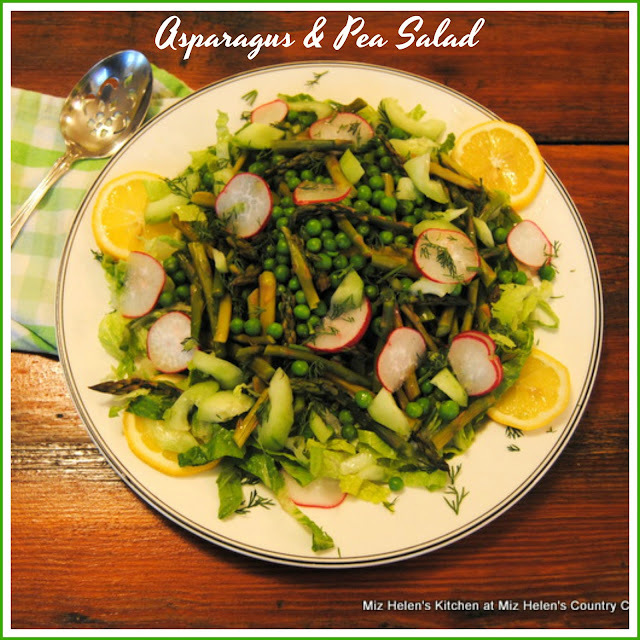 One of my favorite garden to table salads is this delicious Asparagus & Pea salad. This salad is a great side for any meal or would be a fantastic salad for a luncheon. This is a very special salad with a flavorful Lemon Dressing.